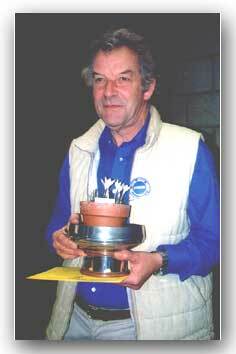 At a recent Alpine Garden Society Show staged in Horsham, a Maplehurst bulb enthusiast, Martin Pollard, was presented with the Sussex Cup for achieving the greatest number of points for first prizes awarded for his bulb exhibits. This was no mean feat as the standard of exhibits at the show rivalled the plants at the Chelsea Flower Show. Martin is an amateur grower with a superior knowledge of the plants he grows and is a typical gardener, always ready to talk plants and exchange knowledge.